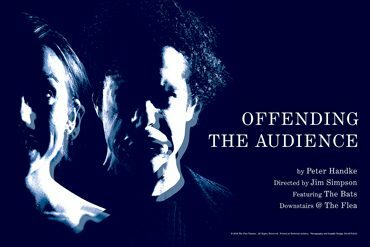 The Flea Theater presents a revival of Peter Handke’s Offending the Audience. It will be directed by Jim Simpson featuring a cast of 22 members of The Bats, the resident acting ensemble at The Flea. Performances begin January 21st with opening night scheduled for Thursday, January 31st at 9:00 p.m.
At the top of Offending the Audience, a group of actors take the stage and announce that there will be no play. They are not characters. The stage does not represent another place. Time passes as it does in real life. There is no illusion. The audience is asked to abandon every expectation, to be the subject of the actors’ gaze the way that they are the subject of ours. So what will happen on stage? Offending the Audience combines caustic humor with deeply meaningful notions about theatre, life and death. The cast of Bats features: Raniah Al-Sayed, Ivory Aquino, Felipe Bonilla, Jon Cage, Jaime Carrillo, Dan Cozzens, Yung-I Chang, Erwin Falcon, Drew Hildebrand, Emily Hyberger, Alexis Macnab, Bobby Moreno, Chance Mullen, Lisa Pettersson, Rachael Richman, Erin Roth, John Russo, Sarah Sakaan, Annie Scott, Sarah Silk, Ronald Washington, and Jeff Worden. Born in Austria in 1942, Peter Handke is one of the most important literary figures of contemporary Austria. In addition to plays, he has written poems, novels, essays, screenplays and directed film. He gained fame among theatergoers with his highly controversial 1966 play Offending the Audience. His other plays include Kaspar (nominated for Play of the Year by Theater Heute), My Foot My Tutor, Prophecy, Self-Accusation and Cries for Help. Handke most recently made international headlines in 2006 when he was awarded Dusseldorf’s Heinrich Heine Prize, but the award was revoked over Handke’s perceived public support for Slobodan Milosevic. Offending the Audience runs from January 21 – February 23.